The state can use other words the defense sought to preclude, including vigilante and wannabe cop. The judge said those words would be allowed in closing so she doesn't see any reason not to allow them in opening arguments. The state agreed that GZ was already out of the car when the police call taker asked if he was following the suspicious person and said "We don't need you to do that." So there will be no reference to Zimmerman getting out of the car in disregard of what the call taker said. Zimmerman never mentioned either Martin's race or clothing until asked by the call-taker Sean Noffke. From the Transcript of George Zimmerman's call to the non-emergency line of the Sanford Police Dept. Noffke: Sanford police department. This line is being recorded, this is Sean. GZ: Hey, we’ve had some break-ins in my neighborhood and there’s a real suspicious guy. Uh, it’s Retreat View Circle. Um, the best address I can give you is one-eleven Retreat View Circle. This guy looks like he’s up to no good or he’s on drugs, or something. It’s raining and he’s just walking around, looking about. Noffke: Okay, and this guy, is he white, black or Hispanic? Noffke: Did you see what he was wearing? O'Mara will depose him, do his research on the professor, and later in the day the professor's trial testimony will be taken by video. There will be 220 witnesses at trial. The state believes all of Zimmerman's statements at the scene are self-serving hearsay (except the ones they want to admit) while the defense says some are res gestae. Given the number of things the court has said will be decided at trial when one of the parties seek to introduce something, it's likely there will be a lot of sidebars with argument during this trial during which jurors and TV viewers will be left twiddling their thumbs. In the probable cause, you can also, IMO, drop the claim Zimmerman continued to follow Martin. If the fact that the dispatcher, and everyone else, can tell Zimmerman is following Martin by the wind noise, than the absence of wind noise has to mean he stopped following Martin when suggested he do so. You can't have it both ways. Did Zimmerman begin to follow Martin again several minutes later? (how could he, unless Martin was hiding and not long gone, and DD is lying)Since he claims he didn't know where Martin was in the dispatcher call, this is going to be problematic for the prosecutors. There is evidence from several witnesses that it was extremely dark in the northern part of the dog path area between the two rows of houses. The moon wasn't up yet, it was drizzling and only one patio light was on and the light didn't extend much into the lawn next too the patio. Add that to the evidence that Zimmerman's main flashlight was not working and he was using a small keychain penlight that was found still turned on near the T. It becomes hard to believe that Zimmerman would be able to recognize and follow Martin after the end of his NEN call. It also seems unlikely for similar reasons that Martin was stalking Zimmerman. They might have just accidentally met at the T. Whatever crimes were committed had to most likely have happened after that meeting. DeeDee's story that Zimmerman ran after and caught Martin is not credible. "It also seems unlikely for similar reasons that Martin was stalking Zimmerman." In the dark the small flashlight would be useless for searching, but even a small light would be easy for Trayvon to track. "They might have just accidentally met at the T."
If Trayvon had continued to walk home after losing George there's no way he would have been at the T for the encounter to occur. The only way Trayvon was at the T is because he wanted to be at the T. Where George was. There really doesn't seem (IMO) to be any rational explanation for the encounter starting at the T other than Trayvon didn't go home (hid) or went back to the T to confront George. We know when Trayvon left the 711 and when Zimmerman saw him; it took about twice the time somebody walking normally would take. Also O'Mara has mentioned that Cell Tower information shows he wandered off the direct path home. After he had rounded the corner of the T, thinking he had ditched Zimmerman, there is no reason to think he wouldn't have continued on the phone with his honey, wandering up and down the dog path instead of going inside Brandi's place and having a brat overhear his phone conversation. Thus my happenstance theory is just as believable as yours. Anyway, how would he know the figure with the penlight was Zimmerman unless he was really close? See also Dave Knechel's video, made on the one year anniversary, on his youtube page. Also O'Mara has mentioned that Cell Tower information shows he wandered off the direct path home. I don't think O'Mara said if the deviation was going out or coming back. Remember, we only have W-8's word on when he left the house. For some reason, no one bothered to get Chad on the record on that point. SAO may have asked him, but it's not in their report (39/284). I don't know of any other evidence on that point. Zimmerman denied that the wind noise had anything to do with his movements. He said it was actual wind. Go to youtube. Someone recreated the incident. Without running, just by walking, you can hear the wind noise past the cellphone. But when you stand still, there's no wind noise. Actually, have someone phone you up, and repeat the experiment yourself. If you can hear the wind noise even without running, just walking, there's no way to prove Zimmerman ran after Martin. There doesn't even have to be any actual wind, just the air moving past the cellphone speaker. Doesn't matter. Neither party offered anything on that to be vetted at the Frye hearing. It's not coming in. I'm not going to 'Go to youtube' to hunt for a video by 'someone'. If you want me to look at it, post a link, or at least some more specific information. can the prosecution still describe the NEN dispatcher's suggestion "we don't need you to do that" as an order? just let me know if this guy does anything else. "Which way is he running?" That was immediately before George Zimmerman exited the vehicle. A reasonable person might think that the dispatcher told me to keep him updated about the guy's activities, and then asked me to identify exactly where the guy was running. Hence, the need to exit the vehicle to keep an eye on the guy. You left out that while exiting his vehicle, Zimmerman said Martin was heading for the back entrance. So what else did the dispatcher need to know? Zimmerman could have easily driven to the back entrance in seconds to check. How much could he see while on foot in the darkness and rain? Zimmerman's real reasons for getting out of the Ridgeline will probably be forever shrouded in mystery. The problem with this is if Zimmerman was after Trayvon, why not drive south, jump out of his vehicle, go east, than confront Trayvon. Certainly quicker. Saying that GZ "profiled" TM is just a handy way of bringing racism into the case without actually mentioning race. In this culture saying that someone was "profiled" automatically brings to mind "racially profiled." 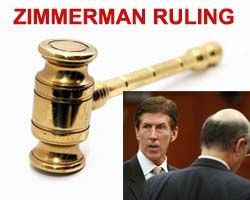 When a prosecutor says that Zimmermman "profiled" Martin, it is very unlikely that the jury will conclude that Zimmerman described Martin in a brief article, or that he drew a picture of Martin's face when viewed from the side. If a prosecutor is more specific, and says that Zimmerman "profiled Martin as a criminal," that's basically saying the same thing as "Zimmerman thought Martin was a criminal." But using the word "profiled" is an odd way of expressing that. Imagine someone saying "When I heard Obama's speech last night I profiled him as a Democrat." Or "I profiled the pickup truck as a Toyota." I think the judge's ruling to allow the use of the term "profiled" in this case is a good issue for appeal due to its clear prejudicial effect. I read news articles every day in various newspapers that say "prosecutors contend that Zimmerman racially profiled Martin." I have often written letters to the editor to try to correct the facts - and I usually say something to the effect of "Prosecutors have gone out of their way NOT to use the words "racially profiled" because the know that the word "profiled" already includes the racial connotation. They are trying to appear to be even-handed while causing jurors to reach a hidden inference."